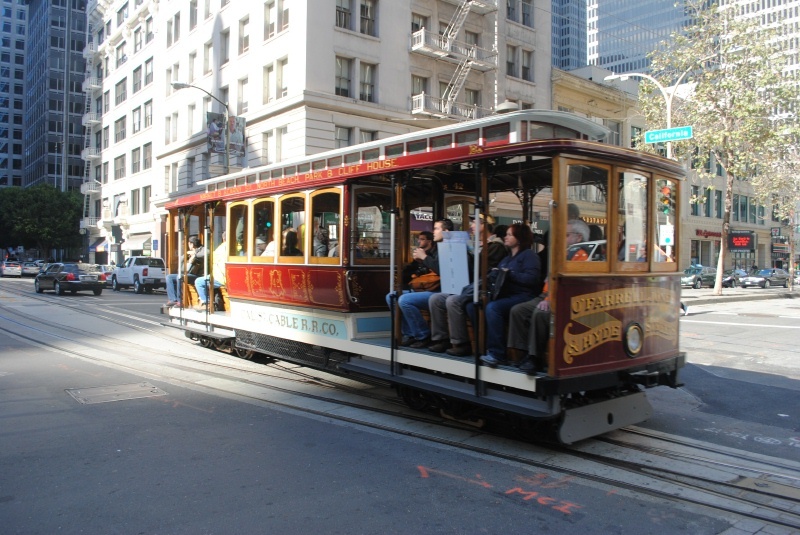 By the early 20th Century, San Francisco's public transit was in the hands of one large monopoly, the United Railroads of San Francisco, and a few smaller companies, which each operated one or two lines, the California Street Cable Railroad, the Geary Street Park & Ocean Railway and the Presidio & Ferries Railway. The people of San Francisco were generally unhappy with the service delivered by the URR, which was owned by interests from Baltimore. A San Francisco Call cartoon suggests that the best gift from Santa would be a Municipal Railway (Source: San Francisco Call, 25-December-1909). In a special election on 30-December-1909, San Francisco voters approved two bond measures to build and operate a municipal railway on Geary Street. 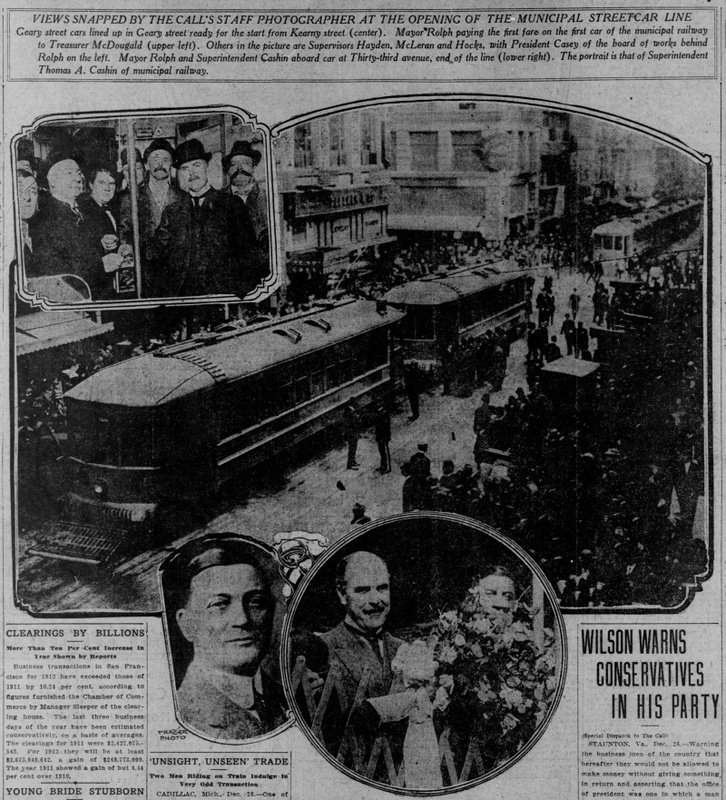 The San Francisco Call celebrates the approval of the Municipal Railway on Geary Street (Source: San Francisco Call, 31-December-1909). 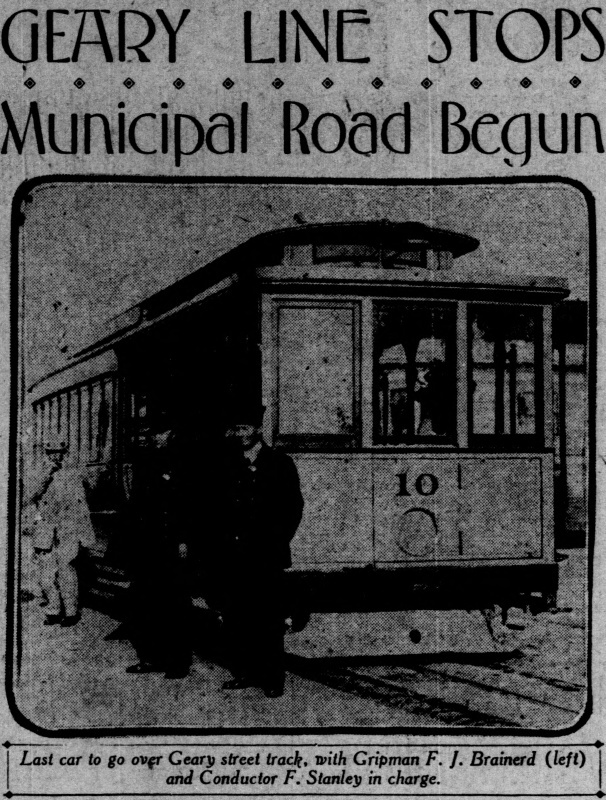 Car 10, the last cable car to operate on the Geary Street Park & Ocean Railway and its crew, gripman FJ Brainerd and conductor F Stanley. 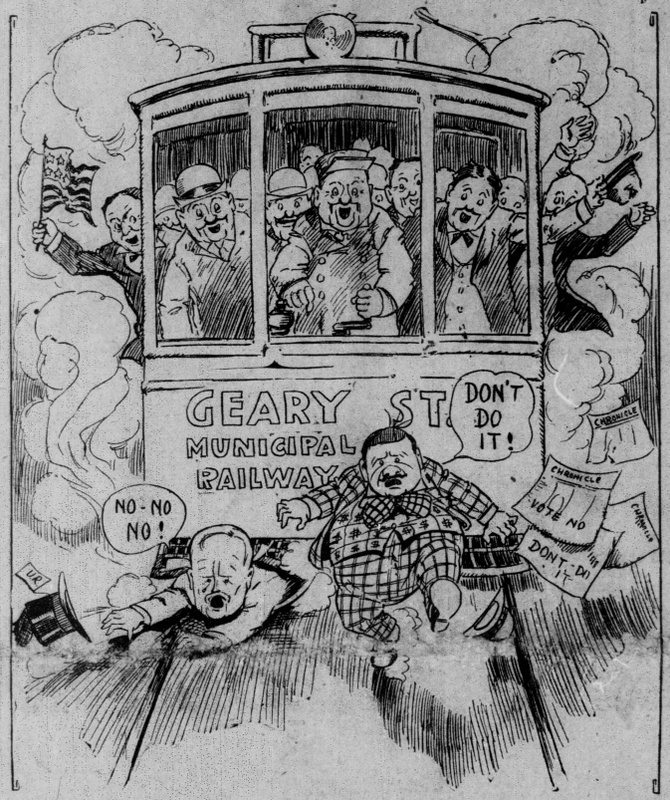 (Source: GEARY LINE STOPS/Municipal Road Begun San Francisco Call, 06-May-1912). 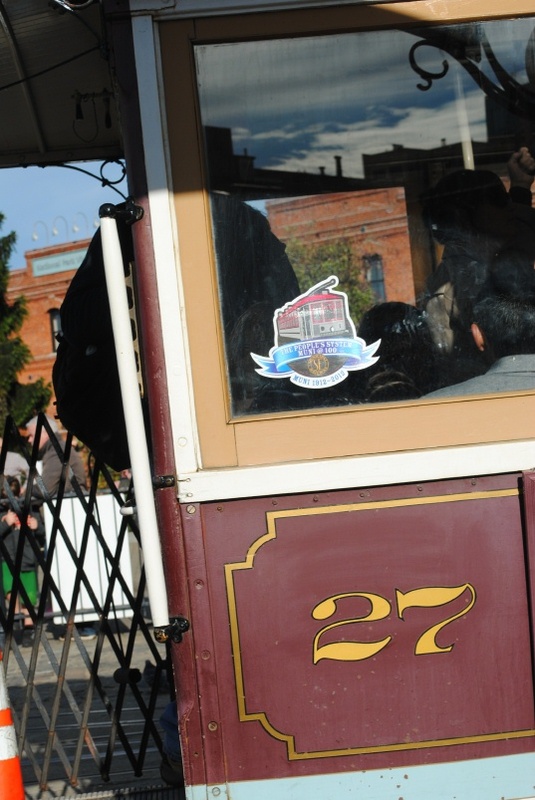 The Geary Street Municipal Railroad first operated on Saturday, 28-December-1912. Mayor Sunny Jim Rolph operated the first car for part of the trip out Geary. 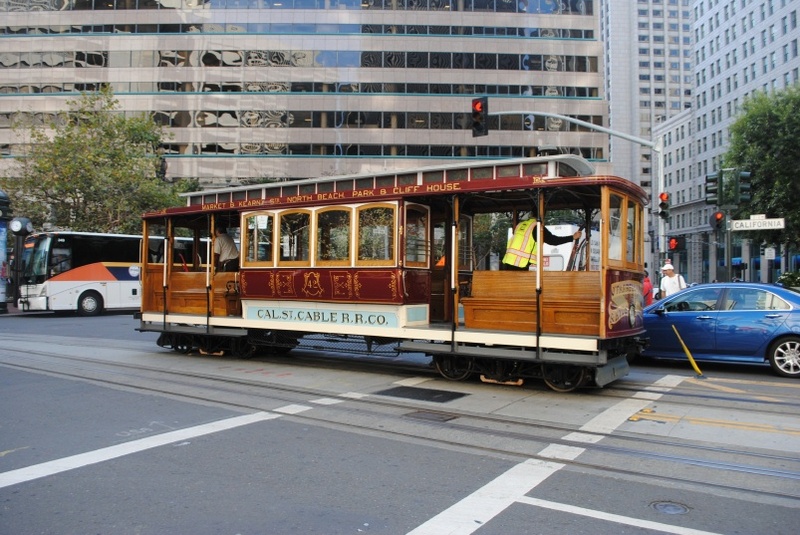 Muni operated no cable cars until it took over the Market Street Railway, successor to the URR, in 1944, when it inherited the former Ferries & Cliff House Powell/Mason and Washington/Jackson lines. 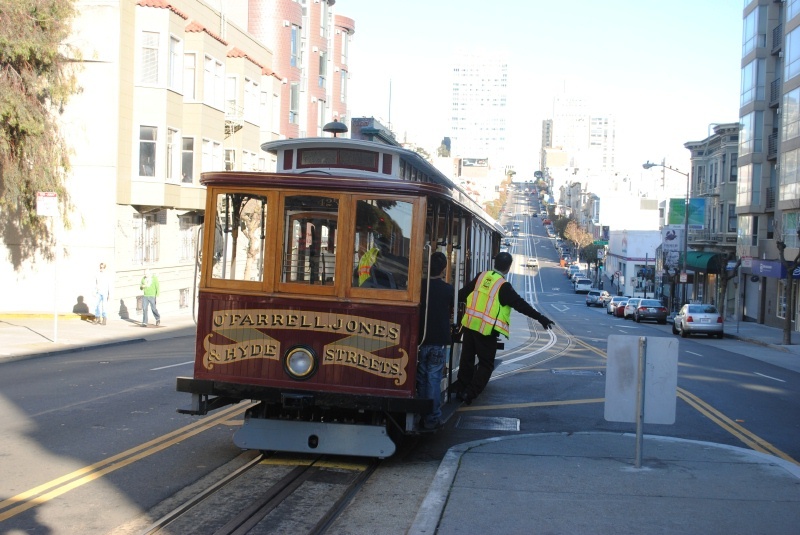 In 1952, Muni acquired the California Street Cable Railroad's California Street, O'Farrell/Jones/Hyde, and Jones Street shuttle lines. Muni killed the shuttle on 06-Feb-1954 and the O/J/H on 15-May-1954. 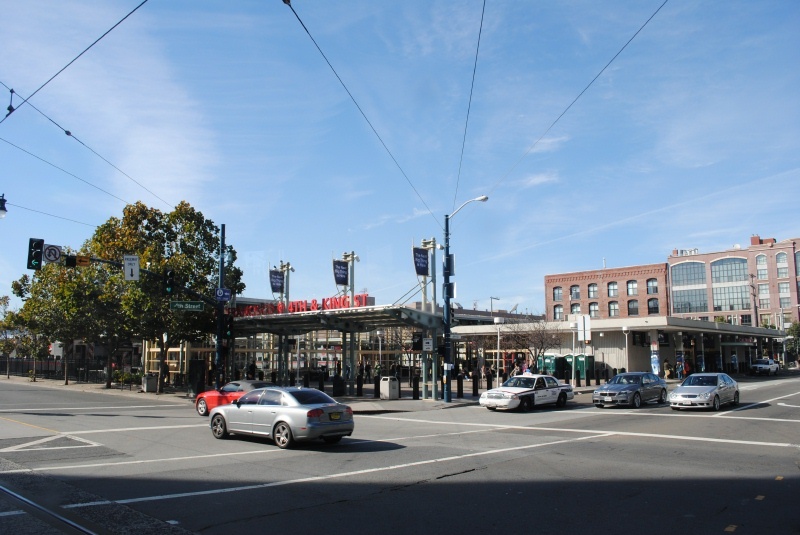 Muni decided to close the Cal Cable barn at California and Hyde and consolidate all operations at Washington and Mason. 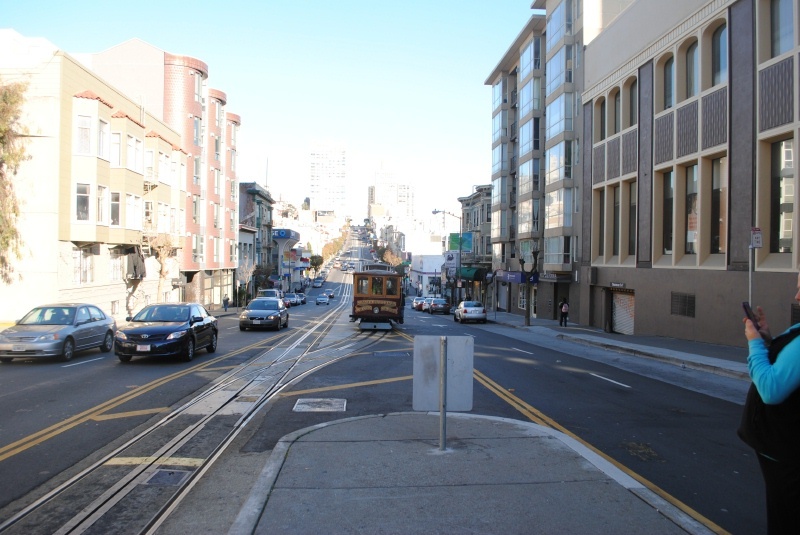 Muni converted the California Street line to use the Eppelsheimer bottom grip between 29-December-1956 and 27-December-1957. Muni combined the Washington/Jackson and O'Farrell/Jones/Hyde lines into the Powell/Hyde line, which opened on 07-April-1957. 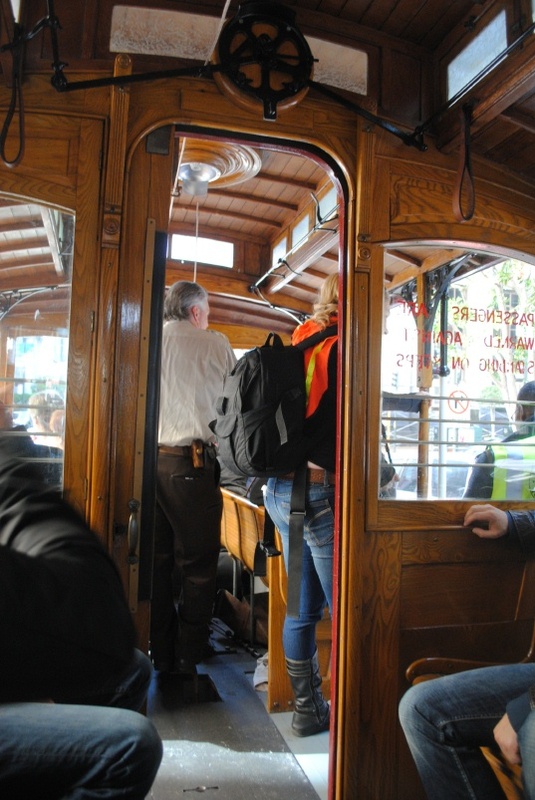 The Cable Car Division, still operated out of Washington and Mason, has some of the best morale in Muni. 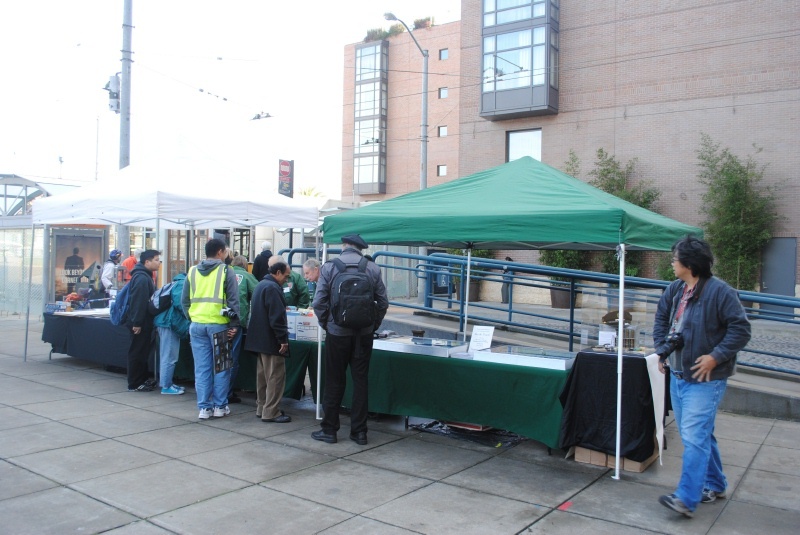 Muni's shopmen and craftsman maintain the cars and build new ones. The San Francisco Main Library is hosting "Cussed and Discussed: 100 Years of the Municipal Railway in San Francisco" (great title), a display of historic transit photos from 02-November-2012 to 24-January-2013. I haven't been yet. On 07-November-2012, Grant Ute, transit historian and co-author of San Francisco's Municipal Railway : MUNI, gave a talk on Muni history at the Main Library. Go to top of the Events section. Cal Cable O'Farrell-Jones-Hyde car 42 crosses Drumm street towards the terminal. 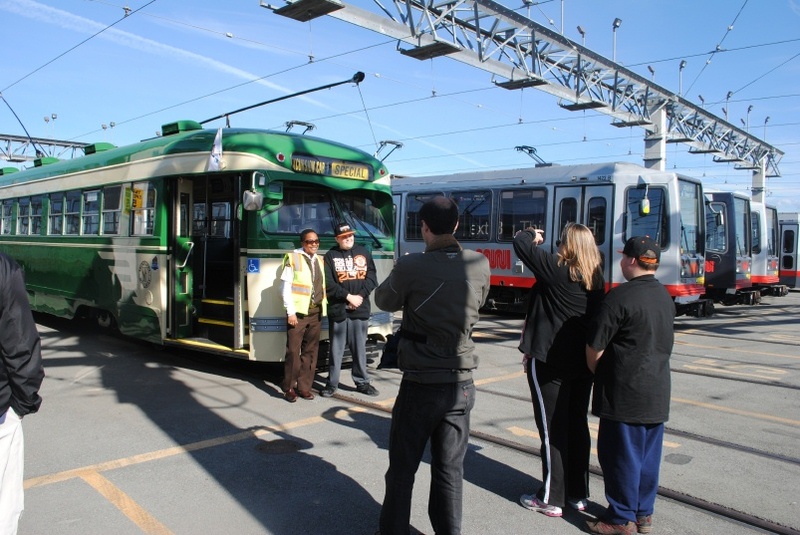 On Sunday 04-November-1912 and Sunday 11-November-1912, Muni ran special service with vintage vehicles to celebrate its Centennial. On the second Sunday, I took BART down to the Embarcadero. I just missed Car One, which rolled by as I rode the escalator up to the street. 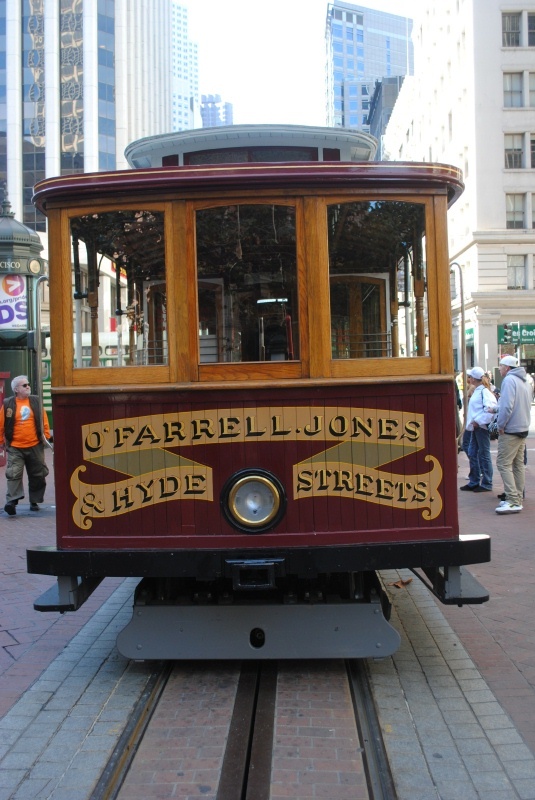 Motorized Jones Street shuttle cable car 62 sits at the plaza. 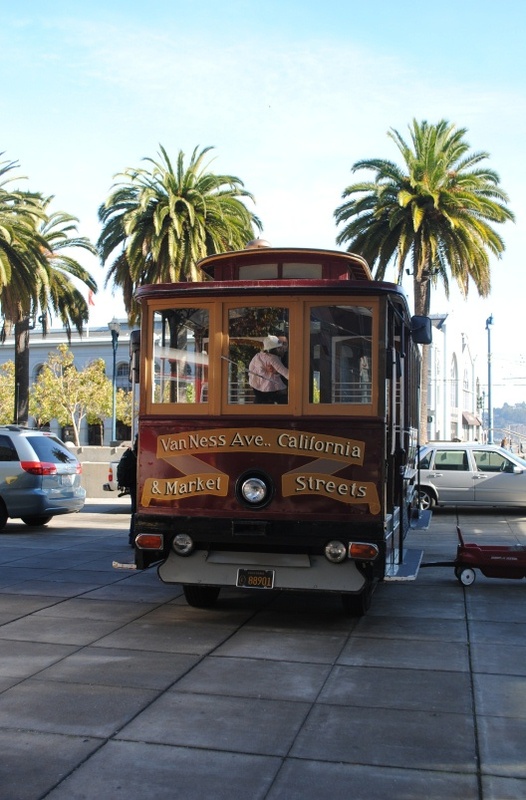 I went by the plaza in front of the Market Street Railway museum and saw General Motors fishbowl 3237, in proper maroon and gold paint, 1941 Saint Louis Car Company trolley coach 506, and motorized Jones Street shuttle cable car 62. 3237 was remarkably clean inside. No slashed seats. 506 was missing several seats and its brakes. Some of us who got on board nearly hit our heads on the roof. 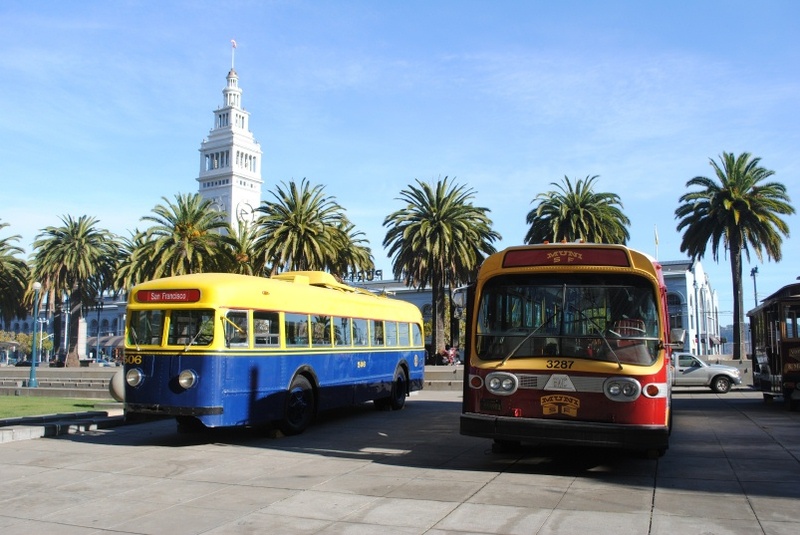 Trolley bus 506 and Diesel bus 3237 sit at the Plaza. Diesel bus 3237's maroon and gold colors and unique scroll Muni logo were inspired by the California Street Cable Railroad color scheme. Market Street Railway 1896 electric car 578 waits to turn into Don Chee Way from Steuart Street. The former headquarters of the Southern Pacific Railroad is in the background. 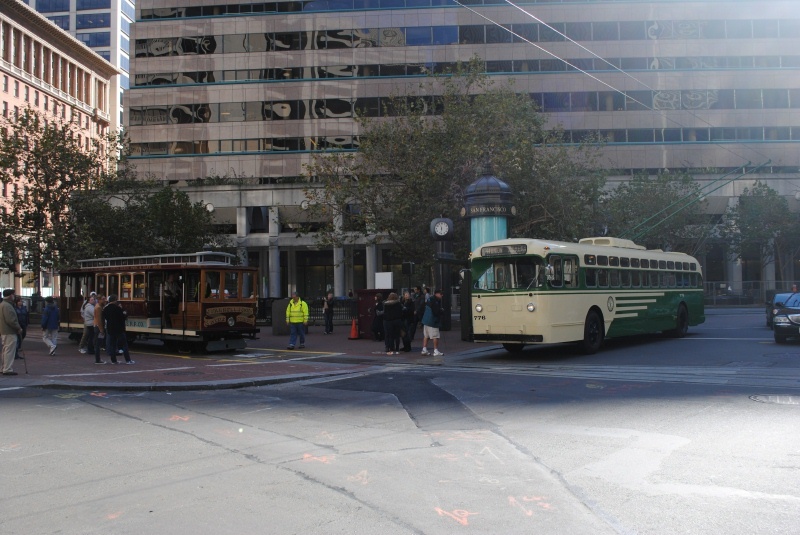 I watched some streetcars arrive, including 1896 Market Street Railway electric car 578 and the last PCC built in the United States, Muni Baby Ten 1040. Many cars were concentrated at this end of Market because the Veterans' Day parade was due to start at 11am. 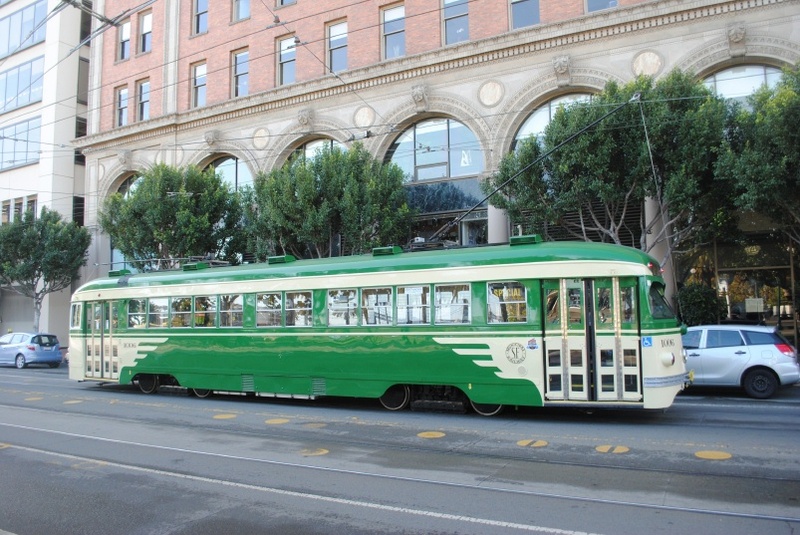 Muni's 1948 Saint Louis Car Company double-ended PCC 1006 had just come back from a thorough refurbishment. Here it stands on Steuart Street, waiting to turn into Don Chee Way. 1006 and its siblings were called Torpedoes. 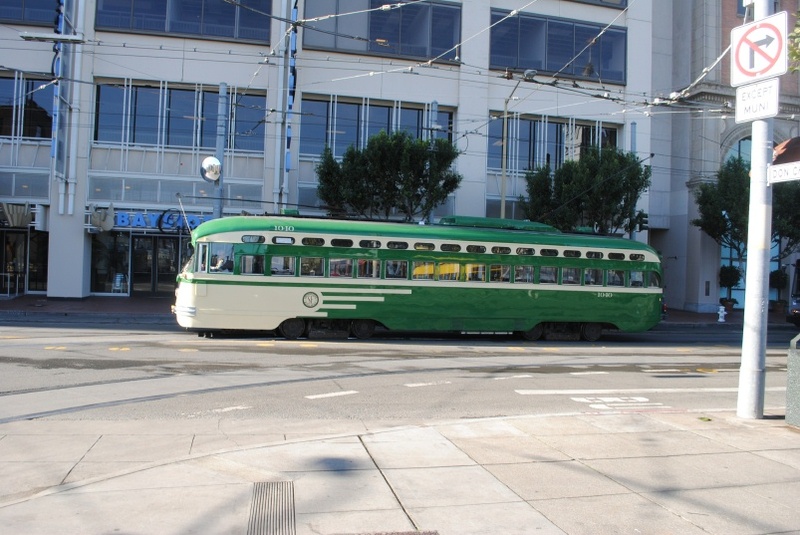 Muni's 1952 Saint Louis Car Company 1040 was the last PCC built in the United States. It had just come back from a thorough refurbishment. Here it stands on Steuart Street, waiting to turn into Don Chee Way. 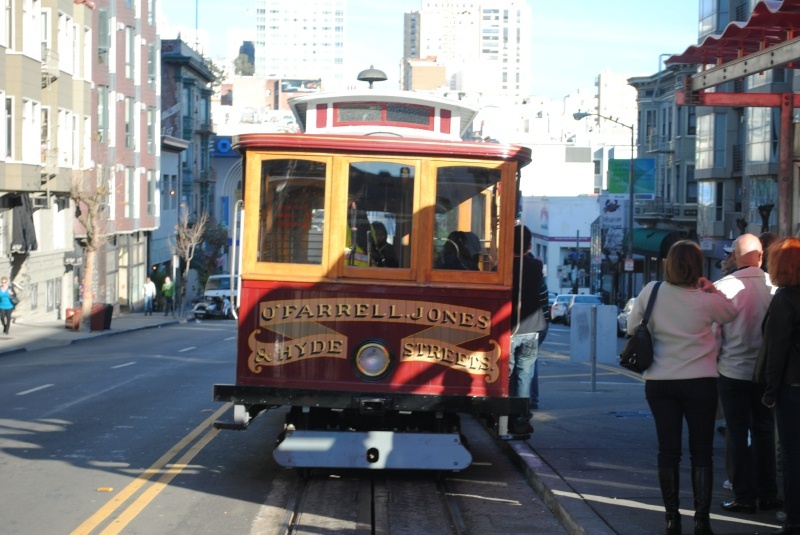 Cal Cable O'Farrell-Jones-Hyde car 42 rolls down California from Grant towards Kearny. Old Saint Mary's Cathedral is visible in the background. I recognized the car in the distance because of certain color and size differences. 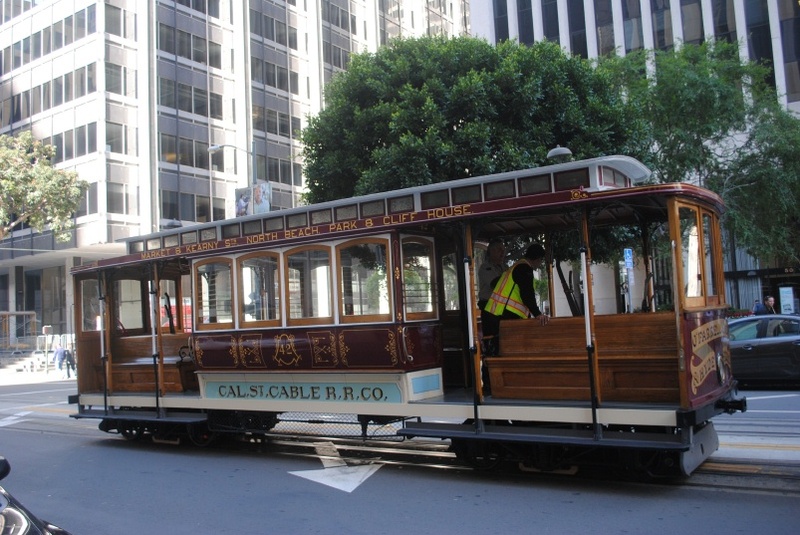 I took a walk up California Steet, hoping to intercept California Street Cable Railroad O'Farrell-Jones-Hyde car 42. It sure was cold. I caught it at Kearny and rode to Drumm. I got a seat in the cabin. It was a nice smooth ride. A broadside view of 42 as it lay over between Davis and Drumm Streets. A detail view of the side of 42 as it lay over between Davis and Drumm Streets. The paint shop did a great job. After 42 reached Drumm, it posed for photos with trolley coaches Flyer 5300 and Marmon-Herrington 776. Both looked a lot nicer and shinier than when they were in service. Several people left on the coaches for a trip around downtown. 42 lays over at California and Drumm. Flyer trolley coach 5300 pauses on Drumm Street. The light was not good. 42 lays over at California and Drumm. Marmon-Herrington trolley coach 776 pauses on Drumm Street. The light was still not good. The O'Farrell Jones & Hyde Street scroll on the end of 42. 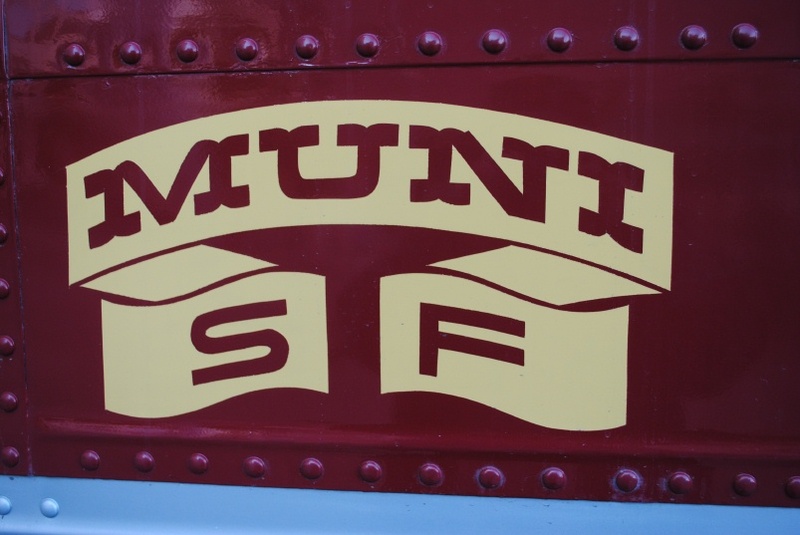 The classic Muni logo on Marmon-Herrington trolley coach 776. 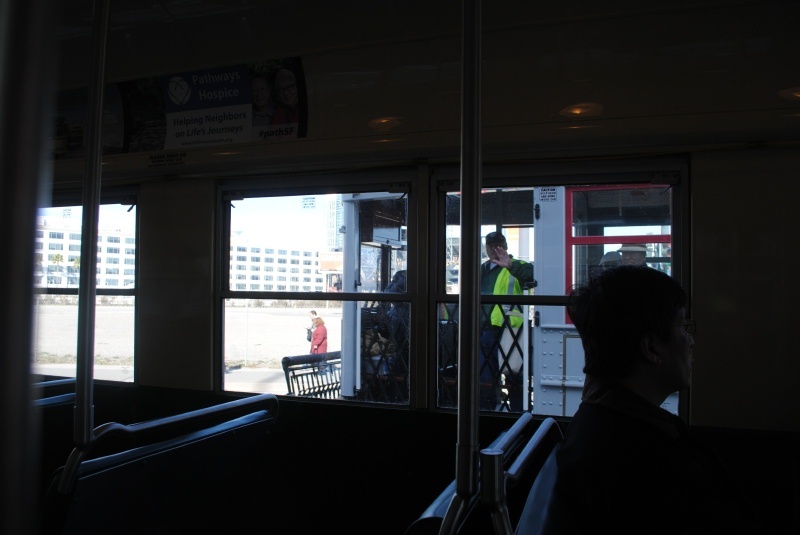 Passengers board Marmon-Herrington trolley coach 776 for the tour. 42 crosses Drumm Street, heading out on a new run. 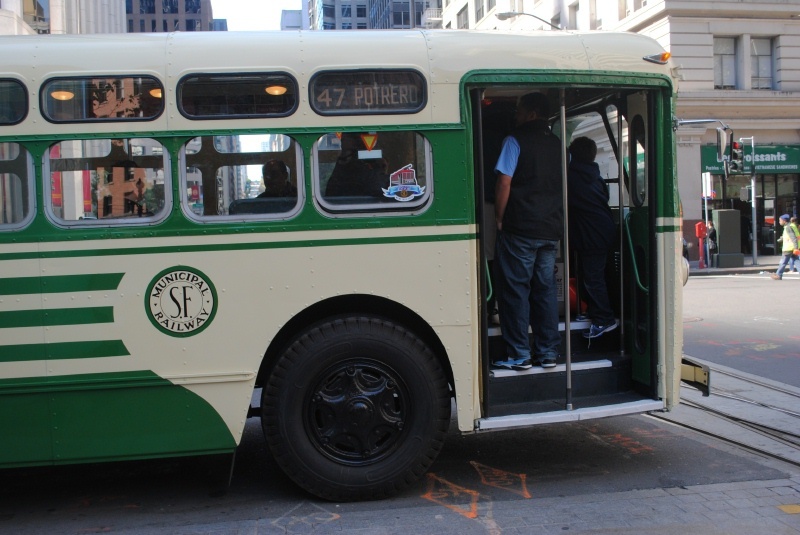 I rode recently restored double-ended PCC 1006 on a trip down Third Street to the new yard at 25th Street. Here motorette (I couldn't say motorman and operator seems too bland) Ronna Brown poses with a young railfan. Breda LRVs are lined up in the background. I got on 1946 Muni PCC 1006 to take a ride out Third for a visit to the new yard. It was interesting to take the loop around. We got out to look around a little bit. 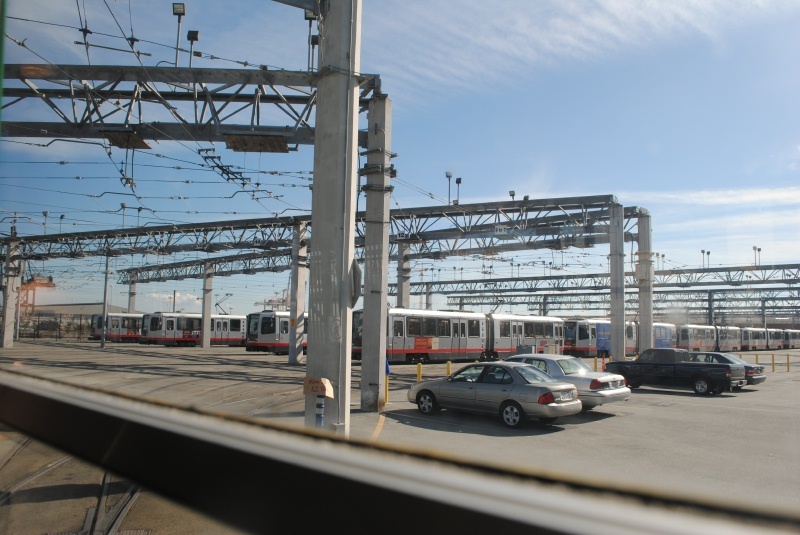 A view of the CalTrain Station at Fourth and King from 1006. 1006 passes inbound Car One, part of Muni's first order of cars, at Third and Channel Streets. Bredas lined up in the new yard at 25th and Third Streets. 1006 pauses in the new yard at 25th and Third Streets. A ghost sign Third Street, from 1006. 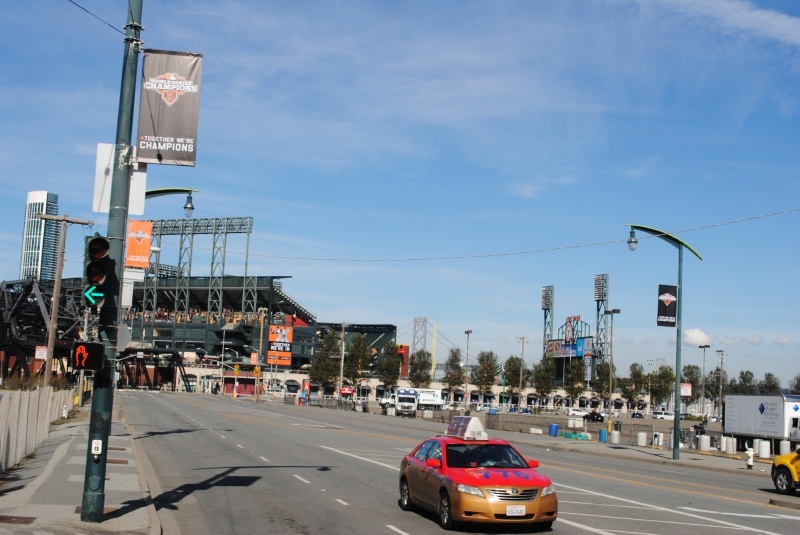 Looking towards the Giants' ballpark, ATT Park, as 1006 turns from Third into Channel Street. 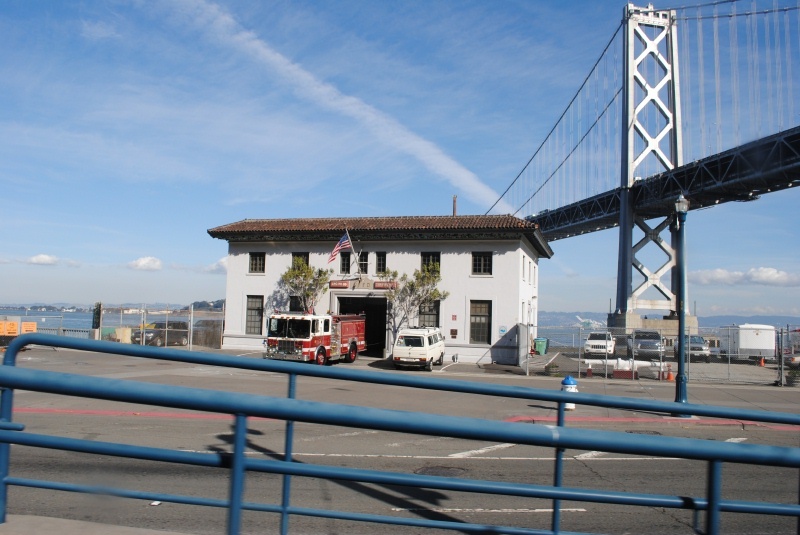 Engine 35 at Pier 22 1/2, Embarcadero and Harrison, is the home of the San Francisco Fire Department's two fireboats, Phoenix and Guardian. The open air book sale in front of the MSR Museum. Back at the open air sale in front of the MSR museum, I bought six issues of Western Railroader for two dollars. Market Street Railway 1896 electric car 578 lays over on Don Chee Way between trips to Pier 39. A detail view of the dash of Market Street Railway 1896 electric car 578. 42 crosses Drumm Street, crossing over to the outbound track. After grabbing a spot of lunch, I got on 42 for a ride out to Van Ness. The car was going back to the barn. Cable Car Division Superintendant David Banbury rode the car and helped passengers get on and off safely at intersections. I walked over to Sacramento and caught a one bus out to my mom's house for dinner. 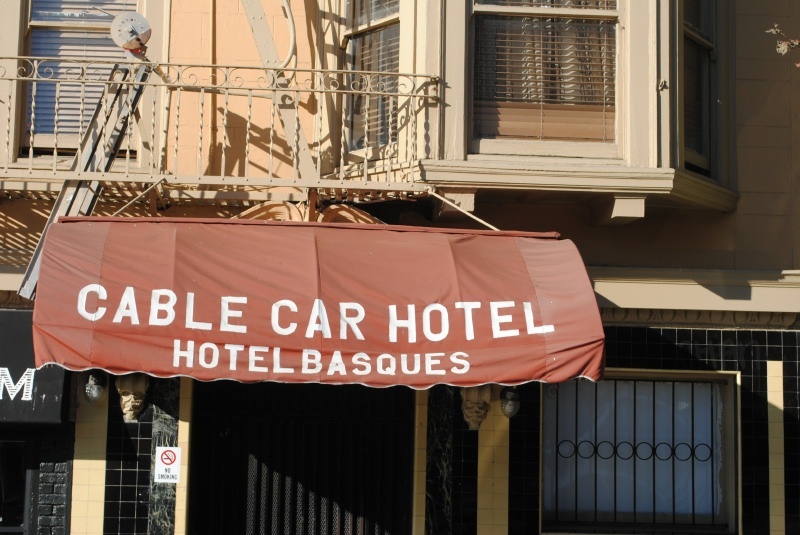 42 passed the elegant Cable Car Hotel. 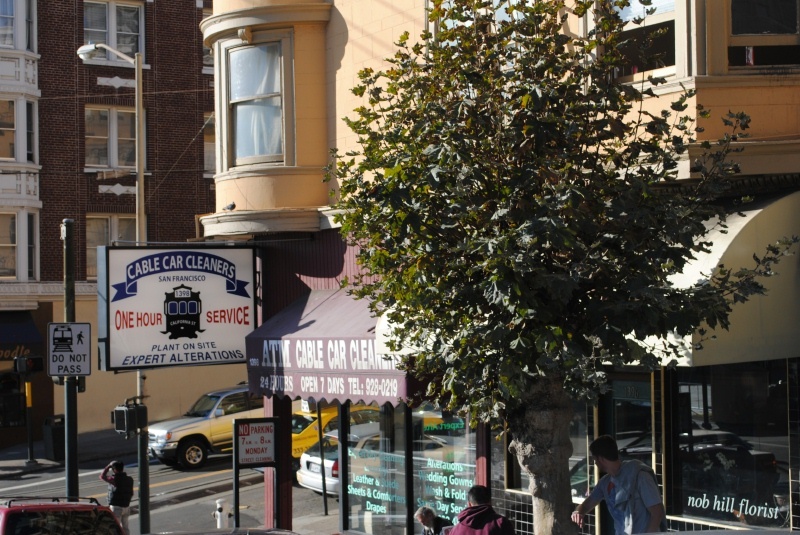 42 passed the Cable Car Cleaners at the corner of Hyde and California. 42 at Vann Ness and California, preparing to switch ends and head back to the car barn. A few riders board 42 at Vann Ness and California for the trip back to the car barn. The gripman releases the brakes and 42 starts to coast through the crossovers on its trip back to the barn. 42 coasts down the hill towards Polk Street, where it will stop to pick up the cable. Val Lupiz took this photo of newly refurbished car 26, along with car 3, at Acquatic Park. Val Lupiz photo. All rights reserved. 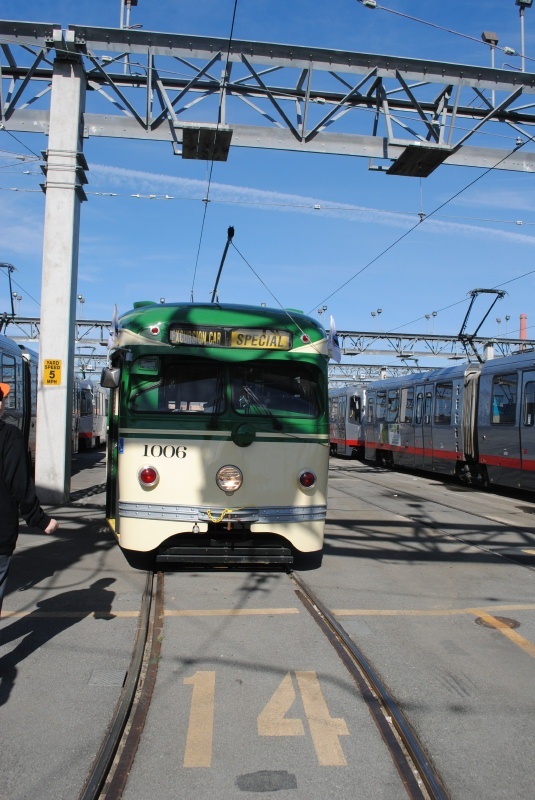 Muni rebuilt car 26 and painted in a color scheme used from the late 1940s until the early 1960s. It rejoined the fleet in a special rededication ceremony on 14-November-2012. I was stuck at work. 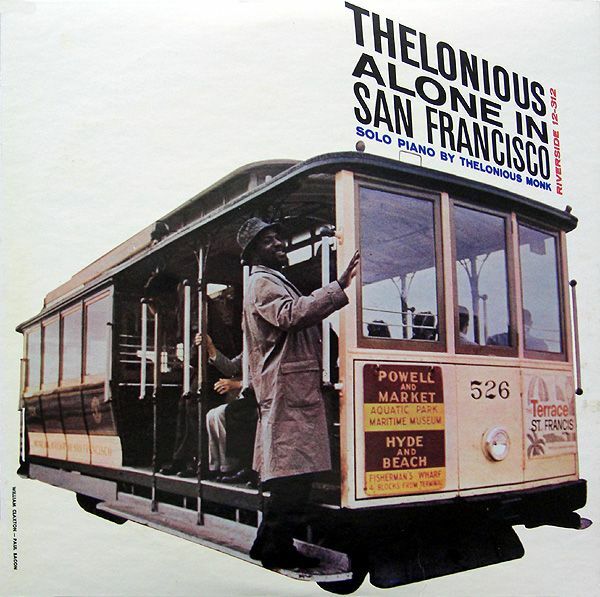 Thelonious Sphere Monk (1917-1982), great American composer and piano player, posed on Powell/Hyde cable car 526 (now 26) on the cover of his album Thelonious Monk Alone in San Francisco. He liked San Francisco. When the car rolled out after refurbishment in 2012, it was in this paint scheme. 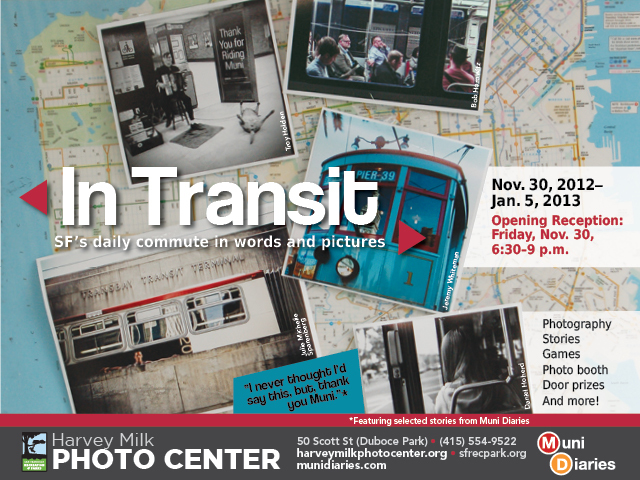 The Harvey Milk Photo Center at 50 Scott St is hosting a display of historic transit photos from 30-November-2012 to 05-January-2013. I haven't been yet. On December 7, the San Francisco Examiner featured a 12 page special section, "Muni at 100, History in Motion," an advertising feature sponsored by the SFMTA. 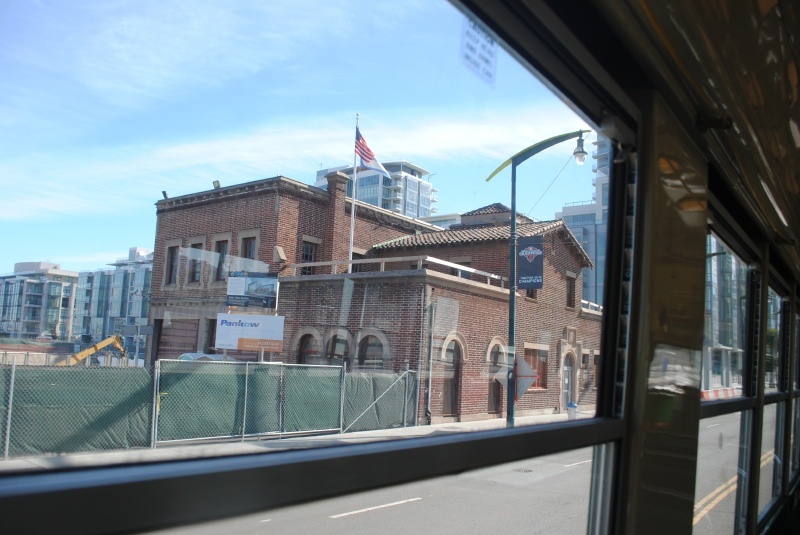 It includes a nice timeline of Muni history and many photos. Muni will offer free service from 5am on Friday, 28-December-2012 through 5am on Saturday, 29-December-2012. I hope to take advantage of it. On Friday, 28-December-2012 Muni offerred free rides to all. I was home sick. Many special vehicles operated, including, of course, Car One. 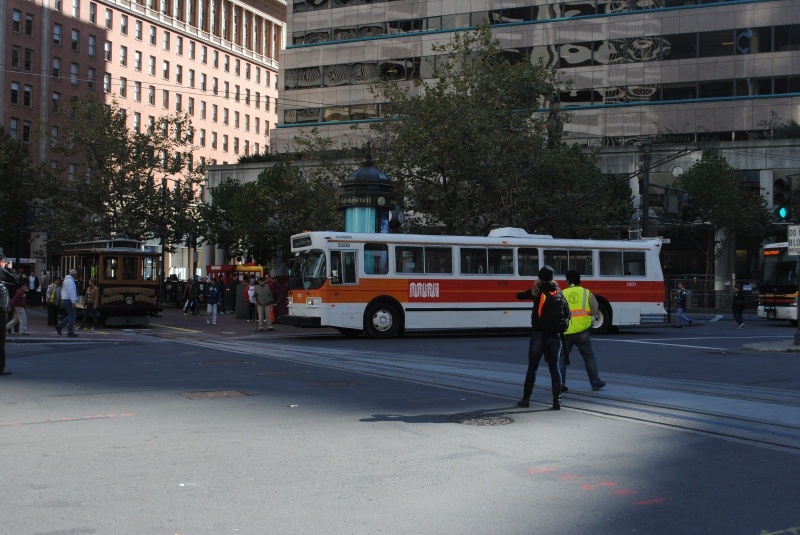 Muni's oldest surviving bus, 1938 White 042, in its orange and black colors, returned to operation. The Market Street Railway Museum hosted a reception and meeting where its president, Rick Laubscher spoke about the future of the E line. 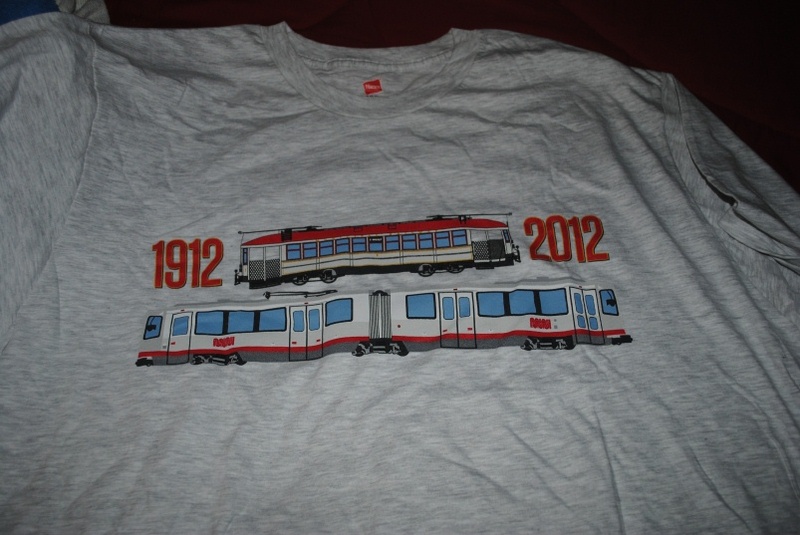 A shirt celebrating Muni's 100th birthday features car 1 and a current Breda. The Market Street Railway offered a variety of centennial merchandise at their museum and on their website. 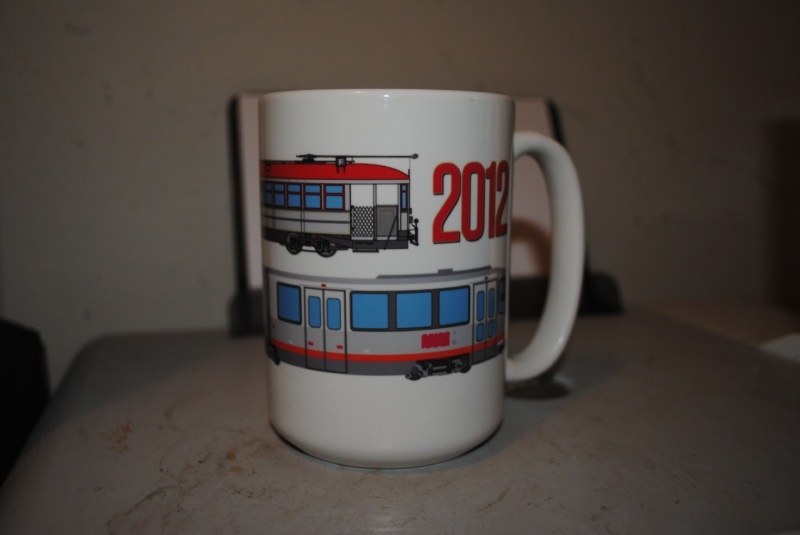 A cup celebrating Muni's 100th birthday. 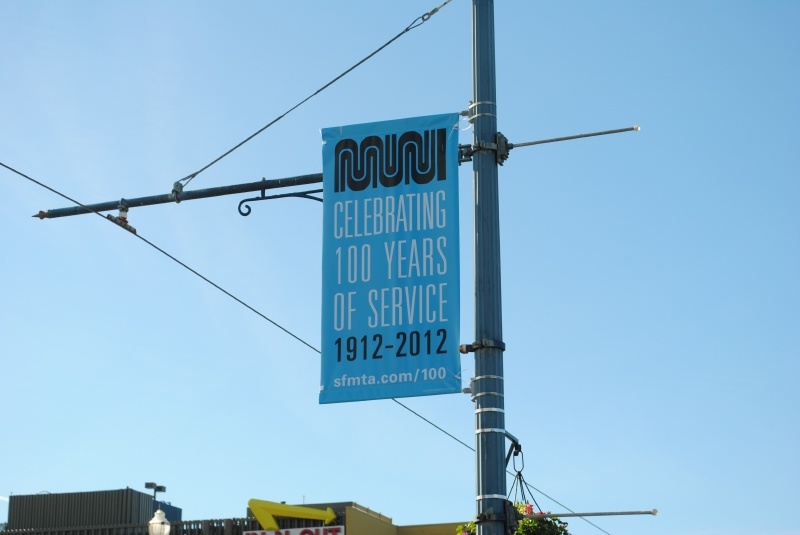 Muni's official 100th anniversary logo. 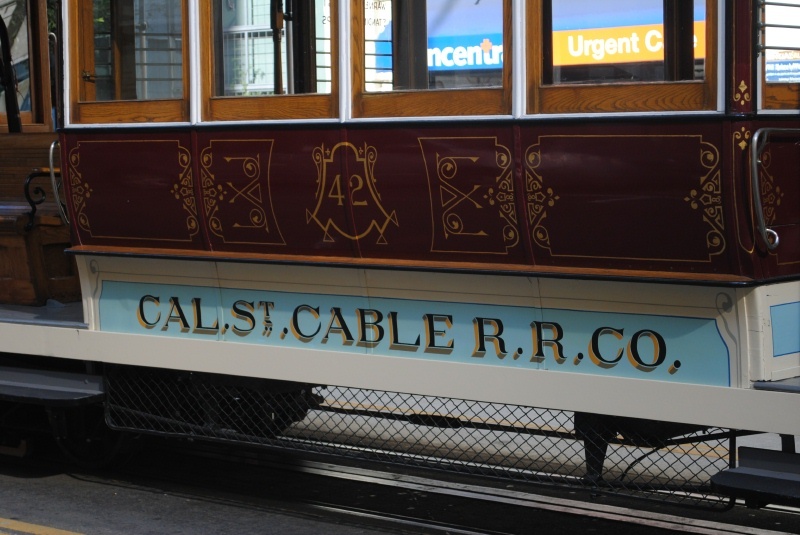 Muni's official 100th anniversary logo on Powell Street cable car 27 at Hyde and Beach. 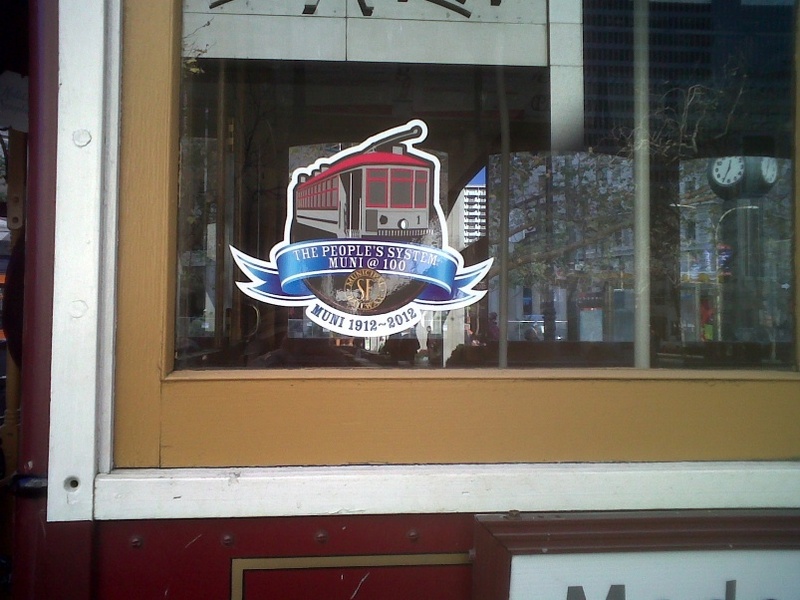 Muni's official 100th anniversary logo on California Street cable car 49 at California and Drumm. 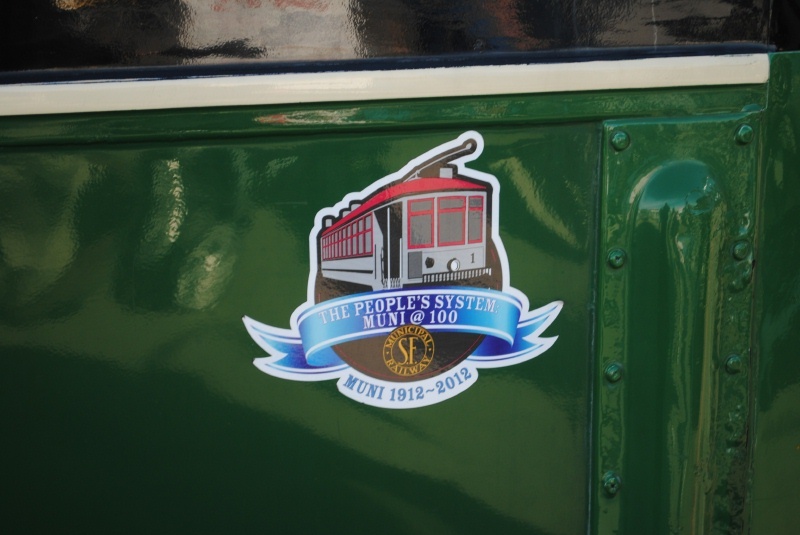 Muni's official 100th anniversary logo on F Line PCC streetcar 1062 on Jefferson Street. 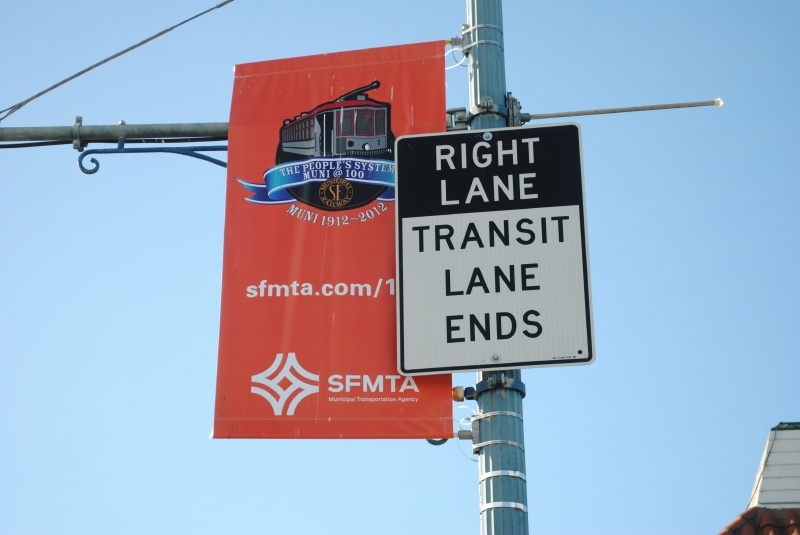 Muni centennial banners on Jefferson Street in Fisherman's Wharf. From The Electric Railway Journal, July 13, 1912. Volume XL, Number 2. Geary Street Municipal Railway, San Francisco, Cal. 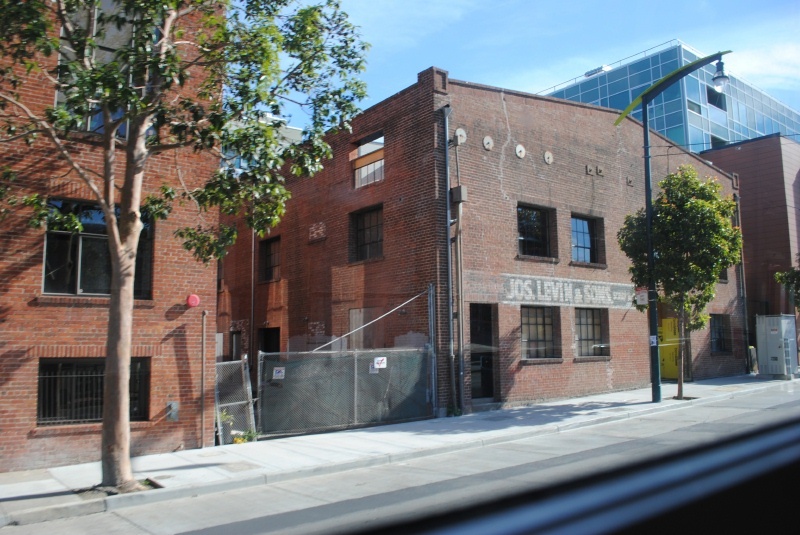 -- The contract has been awarded for the construction of the new building to be used as an office, substation and carhouse at the northwest corner of Geary Street and Presidio Avenue, San Francisco, to F. Rolandi, San Francisco. The structure will be of reinforced concrete. Go to top of The Electric Railway Journal section. From The Electric Railway Journal, July 20, 1912. Volume XL, Number 3. From The Electric Railway Journal, August 3, 1912. Volume XL, Number 5. 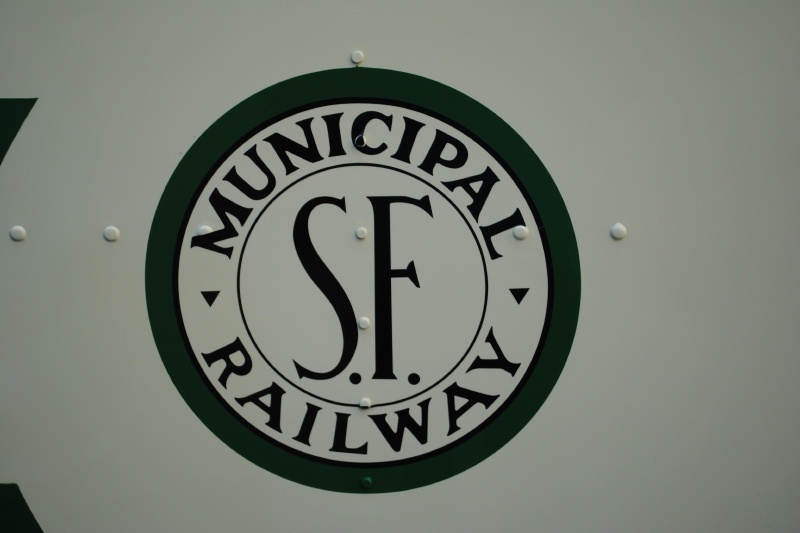 Qualifications for Trainmen for San Francisco's Municipal Railroad. 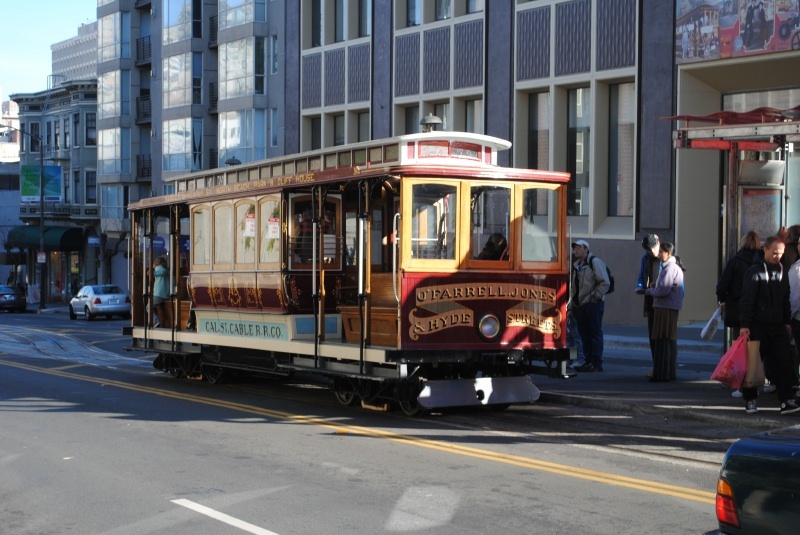 -- The Civil Service Commission of San Francisco has announced that examinations will be held on Aug. 19, 20 and 22 to select applicants for motormen, conductors and inspectors for the Geary Street Municipal Railroad. Each class of employee will be rated differently under the topics of general knowledge of duties, knowledge of equipment and repairs, writing of report, arithmetic, physical ability and experience -- general and special. 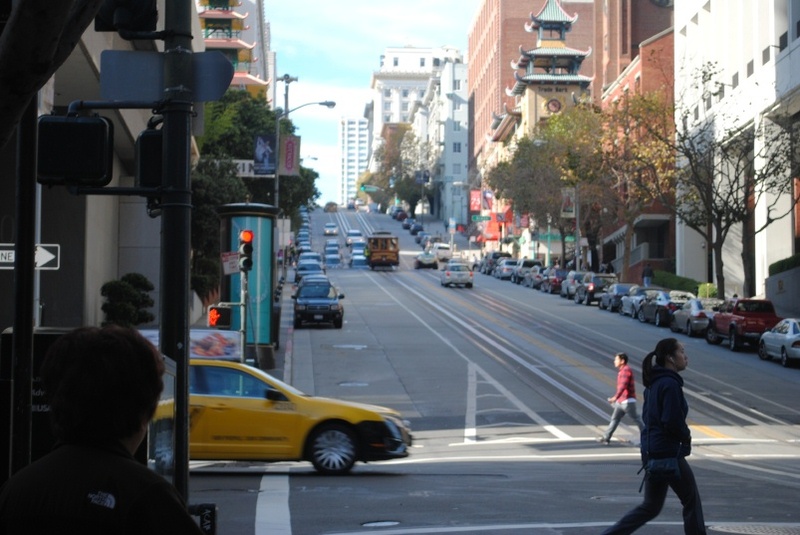 A man who has had five years' experience in California within the last seven years as a motorman will be awarded the maximum credit of 100; periods of less than five years proportionately; experience of less than six months not rated. A conductor or inspector must have had general experience, the rating being on time from six months to five years in the State. For special experience they will be rated thus: Three years' experience had within the last five years in the service of the Geary Street, Park & Ocean Railroad, 100 credits; two years, 75; one year, 50; three years' experience had within the last five years in the service of any other street railway in the State, 50; two years, 40; one year, 20. Applicants must be twenty-one years of age or over and must have resided in San Francisco for at least one year preceding the date of application. From The Electric Railway Journal, August 24, 1912. Volume XL, Number 8. Geary Street Municipal Railway, San Francisco, Cal. -- The Board of Public Works has approved the plans and specifications as prepared by Assistant City Engineer W. M. Larned for the construction of this railway on the two blocks on Market Street from Geary and Kearney (sic - JT) Streets to Sansome Street, where it is intended to make connection with the outer tracks which have been used by the cars of the Sutter Street line in San Francisco. From The Electric Railway Journal, September 7, 1912. Volume XL, Number 10. 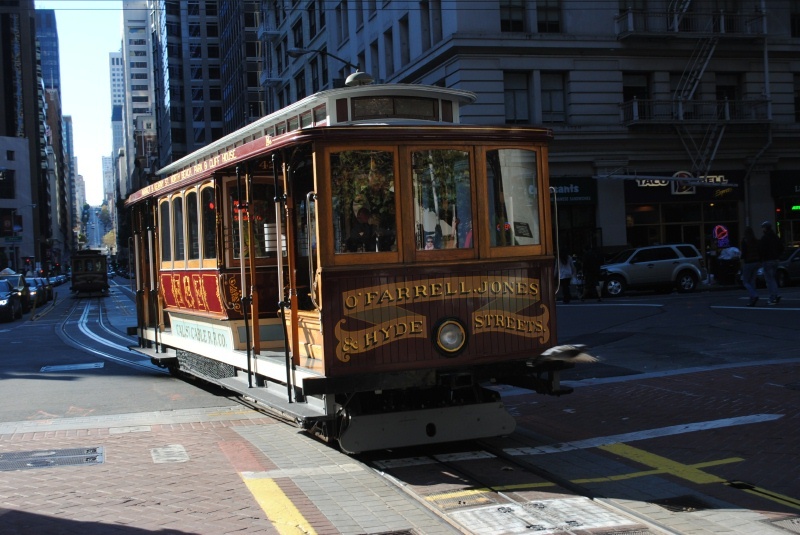 Geary Street Municipal Railway, San Francisco, Cal. -- This company has completed its double-track line from Thirty-third Avenue in San Francisco to the west side of Kearny Street in Geary. From The Electric Railway Journal, September 14, 1912. Volume XL, Number 11. J. W. Reiss, of the W. L. Holman Company, San Francisco, Cal., which has the contract from the city of San Francisco for supplying the forty-three cars for the Geary Street Municipal Railway, has explained to the Board of Works of that city that the company will be unable to deliver all the cars in the time originally specified, but will deliver ten cars by Oct. 25, 1912, ten by Dec. 24. 1912, eleven by Feb. 20, 1913, and the remaining twelve by April 10, 1913. It is expected now that the line will be ready to be placed in service in December. Mr. W. D. Donald, of San Francisco, has been appointed car inspector by the Board of Public Works of San Francisco. Mr. Donald will examine the cars for the Geary Street Municipal Railway to see if they comply with the plans prepared by Mr. B. J. Arnold. Geary Street Municipal Railway, San Francisco, Cal. -- The extension of this line from Thirty-third Avenue to the beach has been considered by the Supervisors' finance committee and this body has directed the Board of Works to advertise at once for bids for the construction of the roadbed and overhead material. From The Electric Railway Journal, September 21, 1912. Volume XL, Number 12. Eclipse Railway Supply Company, Cleveland, Ohio ... Orders have been received for eighty-six standard Eclipse life guards for the Geary Street Municipal Railway, San Francisco, Cal. From The Electric Railway Journal, Octobber 12, 1912. Volume XL, Number 14E. Mr. Thomas A. Cashin superintendent of the Fresno (Cal.) 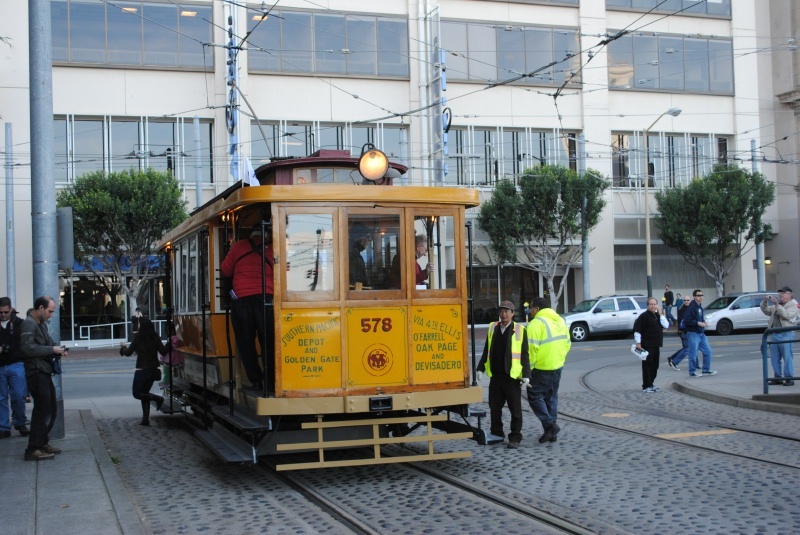 Traction Company, has been recommended to Mayor Rolph of San Francisco, Cal., by the public utilities committee of the supervisors for the position of superintendent of the Geary Street, Park & Ocean Railroad, which the city is reconstructing for municipal operation. 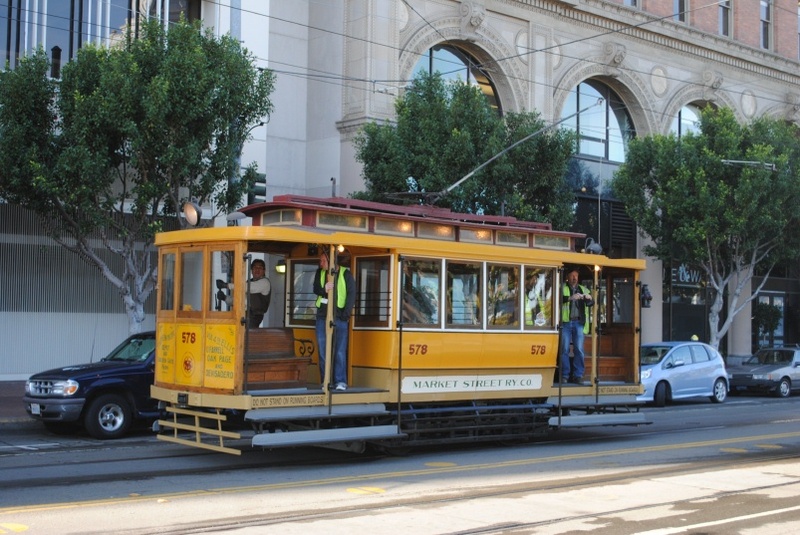 Preparations for Starting Service on San Francisco Municipal Line. From The Electric Railway Journal, November 30, 1912. Volume XL, Number 21. J. W. Riess, vice-president and general manager of the W. L. Holman Company, San Francisco, Cal., which has the contract for forty-three cars for the Geary Street Municipal Railroad, San Francisco, reported to Mayor Rolph of that city on Nov. 15, 1912, that by Dec. 1, 1912, he would deliver ten cars for use on the road and that he would deliver ten more by Feb. 1, 1913. T. A. Cashion (sic - JT), superintendent of the railroad, stated that as soon as he received the first ten cars he would be able to establish service on the line from Thirty-third Avenue to Kearny Street, with a headway of about seven minutes. Commissioner of Public Works Laumeister stated that all the material needed for the lower Market Street extension of the road was virtually on hand and that contracts would be let in about two weeks. From The Electric Railway Journal, January 11, 1913. Volume XLI, Number 2. The placing in operation of the first section of the Geary Street Municipal Railroad, San Francisco, Cal., on Dec. 28, 1912, was attended with elaborate ceremonies in which practically all of the city officials of San Francisco participated. The first car carried among its passengers the Mayor and the city treasurer, and George Schaver, construction engineer, and C. E. Heise, of the Westinghouse Company. The operation of the property is in the hands of T. A. Cashin, who was formerly superintendent of the Fresno (Cal.) Traction Company. Ten cars are being used at present, but forty-three semi-steel, double-end prepayment "California" type cars, seating forty-eight passengers each, are under construction by the W. L. Holman Company, San Francisco. The section which is in operation is about 51/2 miles long. The carhouse is at Presidio and Point Lobus Avenues. It is constructed of concrete and steel and has a storage capacity for sixty cars. It was built at a cost of $228,363. A contract has been entered into with the Pacific Gas & Electric Company for the purchase of power, and current is delivered at 600 volts to the feeders of the railway at Kearny and Geary Streets, Broderick and Geary Streets and Presidio and Point Lobus (sic - JT) Avenues. 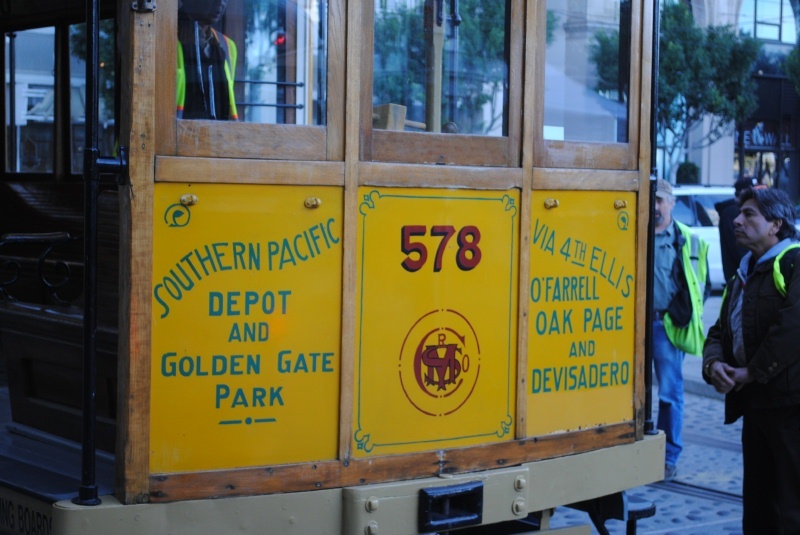 The Geary Street Municipal Railroad is built over part of the route formerly occupied by the Geary Street, Park & Ocean Railroad, the franchise of which expired in 1903. With the expiration of the franchise the first municipal bond issue to build the road was proposed by the Supervisors, but this was defeated as the vote in favor of the plan did not meet the charter provision which required a two-thirds vote in favor of any expenditure of this kind. The second election to effect this purpose was held the following year and the proposition again failed to carry. Nothing more was done in this connection until 1907, when an issue of $720,000 of bonds was authorized by the Supervisors. Suit was brought to nullify this action, and the Supreme Court upheld the contention that the Supervisors had acted without authority. In June, 1909, the plan to issue bonds to provide funds to construct the road was again defeated by the voters. In December of that year, however, on resubmission of the proposition the proposal was carried. An injunction was secured, but the case was decided in favor of the city, and on appeal the Supreme Court of California affirmed the decision of the lower court. In February, 1911, the Legislature of California passed a bill to insure the legality of the bonds, and in April, 1912, the entire issue of bonds was sold to Adams & Company, Boston. The contract for building the road was awarded on April 1, 1912, to Bates, Borland & Ayre, but that firm forfeited the contract and new bids were called. On April 17 the contract was awarded to B. H. Mahoney. He was allowed 180 days to complete the work, with a bonus of $200 for every day which he saved in carrying out the work. 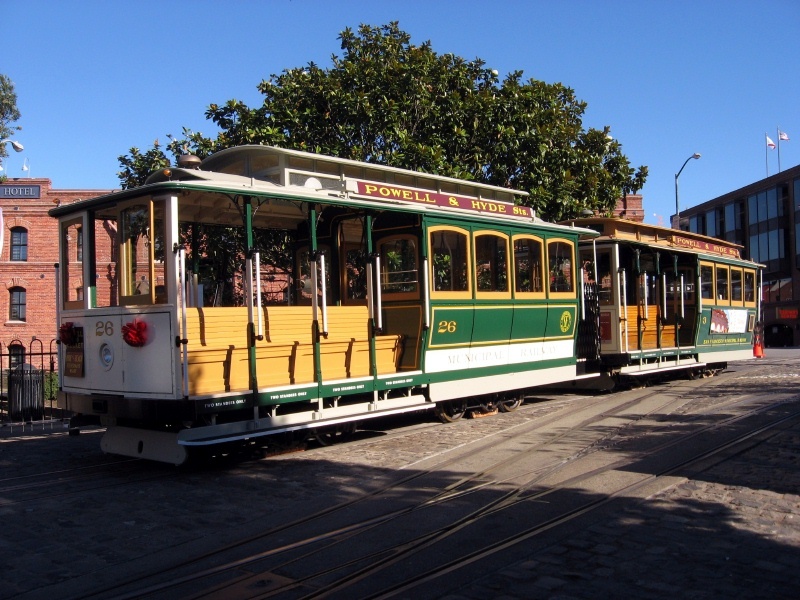 The operation of cars over the route by the Geary Street, Park & Ocean Railroad was suspended on May 5, 1912, and the construction of the municipal railway was begun on May 7. 1912. *Balance expended for this purpose included in track construction. Copyright 2012-2013 by Joe Thompson. All rights reserved.